Benchmark entered the high end audio world with stunning reviews of their DAC1 Digital to Analog Converter. Stereophile awarded it their 2004 Editor's Choice award, and it is a yearly Stereophile Class A Recommended DAC and Headphone Amp. Benchmark followed up with the DAC1 USB, also Stereophile Class A Recommended , which adds a usb connection for computers and improved sound. Benchmark's next offering was the DAC1 PRE, a near state of the art line preamplifier that was a HI-Fi News Outstanding Product, called "stupefyingly good". The Absolute Sound lavished praise on the DAC1 PRE in its August 2008 issue: "it is excellent compared to anything I have encountered at any price." Then the DAC1 HDR with remote, and now the 32 bit Benchmark DAC2 HGC, and the new DAC2 D, and the new DAC2 L. The DAC2 D is the DAC2 HGC without the analog inputs. the DAC2 L is the DAC2 D without the headphone amp, for speaker only listeners. The DAC2 D is a digital reference DAC without the analog inputs. The DAC2 D has the same performance of the DAC2 HGC but without the analog inputs and the 12V trigger. Keeping the specs inline with DAC2 D, it has lower noise, lower distortion, improved accuracy, outstanding musical detail, precise stereo imaging, an advanced digital filter design, and a new high-sample-rate Asynchronous USB Audio interface. All inputs are fully isolated from interface jitter by Benchmark's new UltraLock2™ jitter attenuation system. Internal digital processing and conversion is 32-bits, and includes 3.5 dB of headroom above 0 dBFS. Four balanced 32-bit D/A converter are summed together for each balanced output. The performance of the DAC2 D exceeds the measurement limits of today's state-of-the art test equipment. 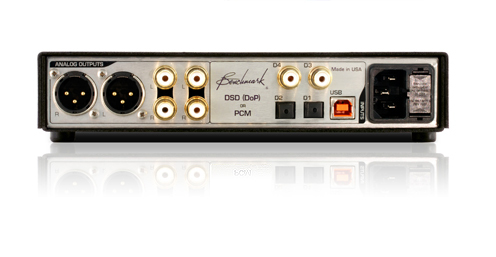 Discover the analog sound of the DAC2 D.
For more information on Benchmark components click here.